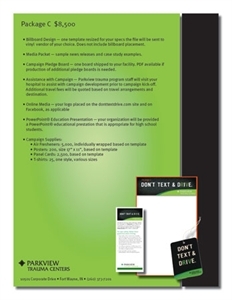 Billboard Design — one template resized for your specs the file will be sent to vinyl vendor of your choice. Does not include billboard placement. Media Packet — sample news releases and case study examples. Campaign Pledge Board — one board shipped to your facility. PDF available if production of additional pledge boards is needed. Assistance with Campaign — Parkview trauma program staff will visit your hospital to assist with campaign development prior to campaign kick-off. Additional travel fees will be quoted based on travel arrangements and destination. PowerPoint® Education Presentation — your organization will be provided a PowerPoint® educational prestation that is appropriate for high school students. We can customize any package for your organization to best fit your needs. For more information about bringing Don’t Text & Drive to your city, contact Lori Hunt at 260-373-7201 or lori.hunt@parkview.com.